It was Gustav Klimt's birthday on Sunday. The art nouveau icon was born on July 14, 1862 and died Feb. 6, 1918. 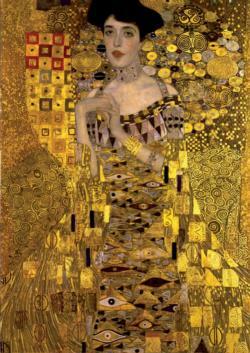 Klimt’s work remains as some of the most expensive on the art market. In celebration of his birthday, Vienna's museums offered an exhibit called "Klimt: Up Close and Personal" - where his artwork was given a new light - not just beautiful reproductions of his most famous golden work "The Kiss," but also showing off the "worst of the worst" - some 100+ objects sent from around the world that Klimt's work has been reproduced on - from toilet-seat covers, bejeweled eggs with rotating figured from "The Kiss" and Elvis music - to pictures of tattoos.